Seniors or past graduates wishing to leave a permanent mark on Eastern Regional High School have the opportunity to do so. The school’s Education Foundation is running an ongoing fundraiser that allows students to purchase a brick engraved with the student’s and/or their family’s names. The brick will be paved into the garden area to the left of the school’s main entrance and in front of the Performing Arts Center. Supporters can purchase two sizes of bricks. A 6 inch by 6 inch brick can be purchased to engrave the name of the student or alum. A 6 inch by 9 inch brick can include the names of all family graduates. The design for the paving area is in the shape of an “E” for Eastern, which was designed by a group of students. Run by the Eastern Education Foundation, the fundraiser has been going on since 2015. All proceeds will go toward the foundation. 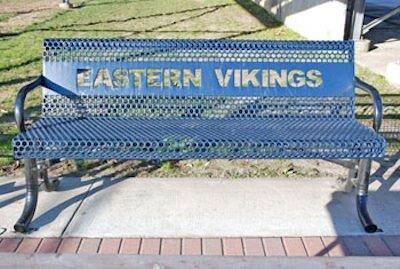 The EEF is a non-profit fundraising arm of the Eastern Camden County Regional School District. Run by volunteers, it raises money for the “Four As” of the district: athletics, academics, arts and activities. In the event any departments, clubs or teams cannot raise necessary funds, the EEF is able to supplement the remainder of what they need to pay. This year, it helped raise money for students to attend the DECA International Career Development Conference in Anaheim, Calif., this spring. So far, it has helped at least 15 activities, sports or departments in the school. It also gives four annual college scholarships to graduating seniors. The EEF is looking for more volunteers. Its next meeting will take place May 15. Order forms for bricks can be found on the school’s website. For any questions on how to purchase a brick, call (856) 346–6740.